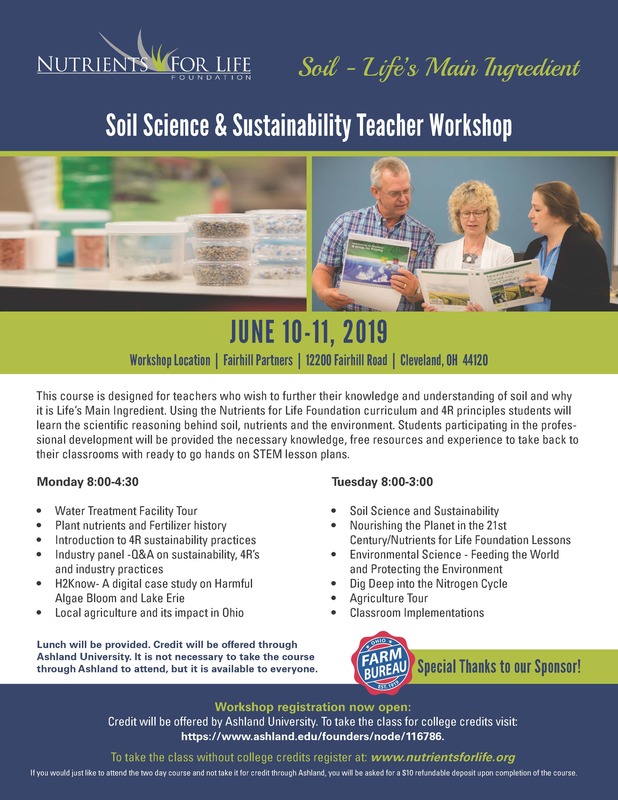 Nutrients for Life Foundation will be hosting our second Professional Development Event, Soil – Life’s Main Ingredient, June 10-11, 2019 in Cleveland, Ohio. The event will be held in conjunction with The Fertilizer Institute’s 4R Summit. This two day course is designed for teachers who wish to further their knowledge and understanding of Soil and why it is Life’s Main Ingredient. Using the Nutrients for Life Foundation curriculum and 4R principles students will learn the scientific reasoning behind soil, nutrients and the environment. Students participating in the professional development will be provided the necessary knowledge, free resources and experience to take back to their classrooms with ready to go hands on STEM lesson plans. Credit will be offered by Ashland University. To register for Soil – Life’s Main Ingredient for credit visit: https://www.ashland.edu/founders/node/116786 . If you would just like to attend the two day course and not take it for credit through Ashland, you will be asked for a $10 refundable deposit upon completion of the course. Click here to register for the event without Ashland credit now.